A Better Wrist: How Should You Respond to "How Much Is that Watch?" How Should You Respond to "How Much Is that Watch?" Advice columnists frequently say that it’s fundamentally rude to ask somebody how much something costs. But really it’s not. When somebody asks you how much your watch is, that means they have noticed your watch and you should do a happy dance right then and there. Break out the Champagne, too. How often does somebody notice your watch? About as often as cicadas come out of the ground, I bet. sake than the search for any improvement of a rate. 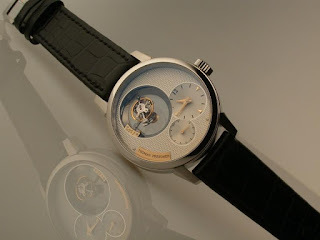 case than either the single or the double axis tourbillons. sculpture of time.” Photo from . That may be true for engagement rings because everyone notices them, like they notice a stretch limo and wonder how much it costs to rent. But because watches are the quintessential under-the-radar accessory, the fact that somebody actually takes an interest in your watch is a like finding a two-bedroom apartment in Manhattan for $2,000 a month, or finding a real Rolex Submariner at a flea market for $100. It’s exciting and you should take advantage of that. So what should you say? You should say two things: the actual price and everything about the watch. The question is, what should you talk about first? The price or your remarkable watch? Get the price out of the way. Be honest. Don’t worry that the person who’s asking might think that’s an outrageous amount of money to spend on a watch (assuming that it cost a lot of money). The friend, stranger, or family member who’s asking might have an expensive hobby, too. Maybe they collect yachts or breed expensive show dogs. Or not. It doesn’t matter, because the only way to talk about what comes next is to quickly immerse them in the notion that some watches cost a lot. Tell them quickly and get that part over with. Just as it’s better to jump into a cold swimming pool than it is to wade in painfully. Whatever fun watch facts you have on the tip of your tongue, have them at the ready. You are now the Ambassador for all of Watchdom. Talk about how Breguet invented the tourbillon, how Rolex popularized the self-winding watch, the rivalry between Omega and Rolex in James Bond movies, Martin Luther King’s Rolex, how the Swiss beat the Quartz Revolution, how a co-axial escapement works, your favorite watch complications, your grail watch, how watchmakers are continually making advances in mechanical technology, such as HYT, which blends fluid mechanics and traditional watchmaking, or describe the Parmigiani Ovale, whose hands change size as they move around the oval face. Tell your friend about how tourbillons defy gravity, and how clever, creative, and breathtaking tourbillons, French for “whirlwind,” are. And that the tourbillon was invented in 1795. You have a lot to talk about. You will dazzle your friend with wonders from the watch world. They will want to buy a beautiful watch. That’s your job once somebody asks you to reveal your watch’s price. You can turn the innocent question “How much did your watch cost?” into an opportunity to convert your friend into a watch lover. And let them know that there are great, far less expensive, watches, too.